C/LW – Tyler Ennis (neutral): Whoever said money doesn’t bring happiness can leave, because Ennis just might be the happiness man alive this summer. Ennis became a rich man, signing an extension worth $23 million or a $4.6 million AAV over the next 5 seasons. With the money all settled, he can focus on hockey and maybe, just maybe improve upon his career season he set as a rookie posting 49 points in 82 games. But until I see it, that’s when I’ll believe it. G – Jhonas Enroth (rising): After Miller was traded to the Blues, Enroth finally got to feel what it felt like to be a starting goaltender, and it wasn’t exactly pretty. Over 28 games, he had a 4-17-5 record, and a 2.82 GAA, and .911SV%. Despite those numbers, it’s less of a reflection on Enroth than it is of the entire team. Look for Enroth and Neuvirth to battle it out for the starting gig next season. RW – Brian Gionta (falling): At 35 years of age, as much as his salary says he’ll be counted on for top-6 scoring, he won’t be. The Sabres signed him to a 3-year $12.75 million deal that carries him until the end of 2017. The Sabres are a young, and inexperienced team and brought Gionta in to bring much-needed leadership to the table, not scoring. Expect anywhere from 30-40 points for the winger. 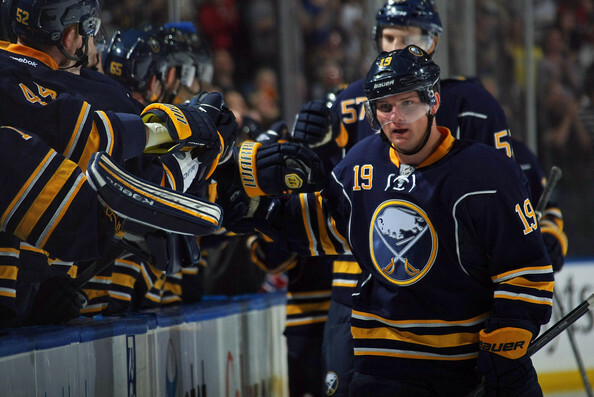 C/RW – Cody Hodgson (rising): Last season, Hodgson led the Sabres in points with 44 (20 goals, 24 assists) in 72 games – the lowest total for a leading scorer of any NHL club. Despite top draft pick Sam Reinhart being expected to make the team, Hodgson will be the one the Sabres lean on, at least until he is comfortable for top line minutes. Expect Hodgson to lead (or come close) to leading the Sabres in scoring next season. LW – Matt Moulson (falling): Haters have been following Moulson his entire hockey career, yet every time; he finds a way to shut them up. They said he’d never make the NHL. At 27 years old, he did. They said he was just a product of Tavares. Last year, he proved he wasn’t, proving a valuable piece to both the Wild and Sabres when he scored 42 points over 64 points between them. Sure, he may not be the 30-goal scorer he was with Tavares – but a top-6 winger with 20-25 goals and 50-60 points? Hell yeah he is. After signing a lucrative deal with Sabres, look for him challenge for the team-scoring title for the blue and yellow, but less points than he did with John Tavares. D – Tyler Myers (rising): After seeing Miller and Vanek traded, and Ehrhoff bought out last season, it appears the Buffalo Sabres consider Tyler Myers as a part of their core going forward. Since his rookie season, Myers has seen his numbers fall from 48, to 37, to 22, to 8, and then back up to 22 in 13-14. Despite his struggles, the Sabres still have faith in him. Look for him to try to take advantage of increased power-play time with Ehrhoff off to Pittsburgh. G – Michal Neuvirth (rising): Last season Neuvirth was traded to the Sabres along with Rostislav Klesla in exchange for Jaroslav Halak and a 3rd round pick. Neuvirth had lost the starting job to Holtby in 11’/12’ towards the end season, and since then has been subject to backup duties. With the Sabres, he suited up for 2 games this past season and posted a 0-2-0 record and a 2.56 GAA, and a .949 SV%. In 2013-2014, Neuvirth will look to reclaim his status as an NHL starting goaltender. Given his experience as a starter, the ball is in the Czech’s court to begin the 2014-2015 season. RW – Chris Stewart (rising): When Stewart was sent to the St. Louis Blues along with Kevin Shattenkirk for Erik Johnson and Jay McClement a few seasons ago, early on the Blues believed he could be a 40-goal scorer for the club. Fast forward a few years, one looking back on it might consider that laughable. But given his success the years prior (28G in 09-10 over 77 games and 28G in 10-11 over 62 games) is it? In St. Louis, he was largely subject to 3rd line minutes, and did have some difficulty staying healthy. If Stewart can stay within the top-6, a big season is very possible from the Toronto-native. C – Sam Reinhart (rising): This past July, the Buffalo Sabres owned the 2nd overall pick of the 2014 NHL Entry Draft. After selecting defensemen Rasmus Ristolainen and Nikita Zadorov in last year’s 1st round of the draft, they opted for a centreman this time around, selecting the WHL’s Sam Reinhart. Many believe because of Reinhart’s mature 2-way game and plethora of other skills – his shot, skating, hockey IQ – he will make the Sabres next year. If he does, look for him to skate anywhere from the 2nd to 3rd line spot and challenge for the Calder Cup.